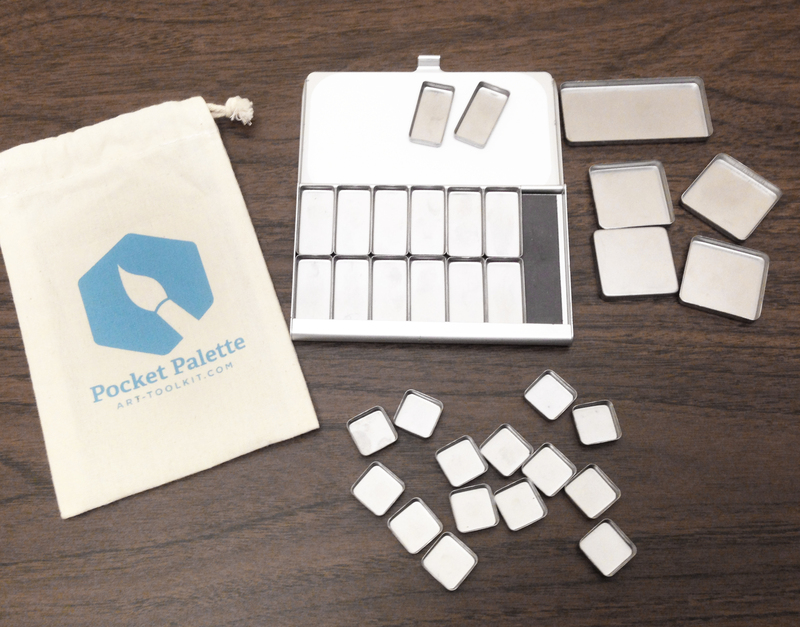 Expeditionary Art’s New and Improved Pocket Palette < Plus a Discount Code! This is kind of timely news, as I’m planning to use this new piece of kit for #OneWeek100People2018. Maria Coryell-Martin at ExpeditionaryArt.com recently sent me the next generation of her ultra-compact Pocket Palette. The design remains the same as the original version, up-cycling pre-existing cases for 2×3″ business cards, but this update makes improvements to the magnetic tins, which should eliminate a problem with the trays rusting. But more importantly – she’s introduced a super-cute square tin she calls a half-pan, which I find to be a perfect size. 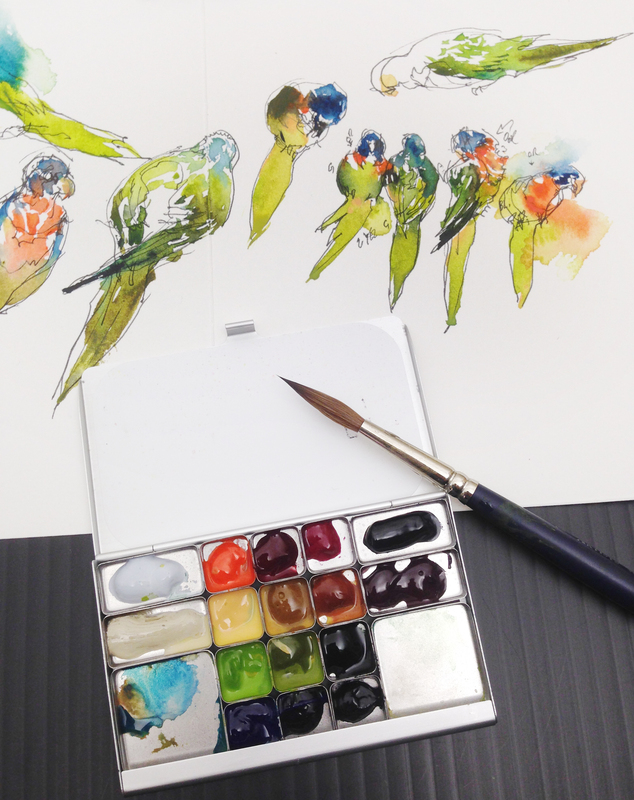 The new mini-square holds just a dot of color, only a bit more than the cap of a watercolor tube. I love the new tray size. It’s perfect for what this palette is designed for. It’s not about carrying a lot of paint. I doubt anyone’s going to rely on this tiny kit as their only palette for a month-long vacation. This is more of an everyday-carry. Something discreet to bring to a live event, a cafe, or a museum. In the end, I’d rather have tiny amounts of more colors, instead of larger pans of fewer, knowing I’ll only be using this for a dab of color on a sketch, or maybe a postcard-sized piece. If I ever wanted the larger trays, I’d just bring my normal 3×5″ kit. Basically, these half-pans (which I’d personally call 1/8ths) allow me to approximate my standard palette in miniature. I don’t have to change how I work. 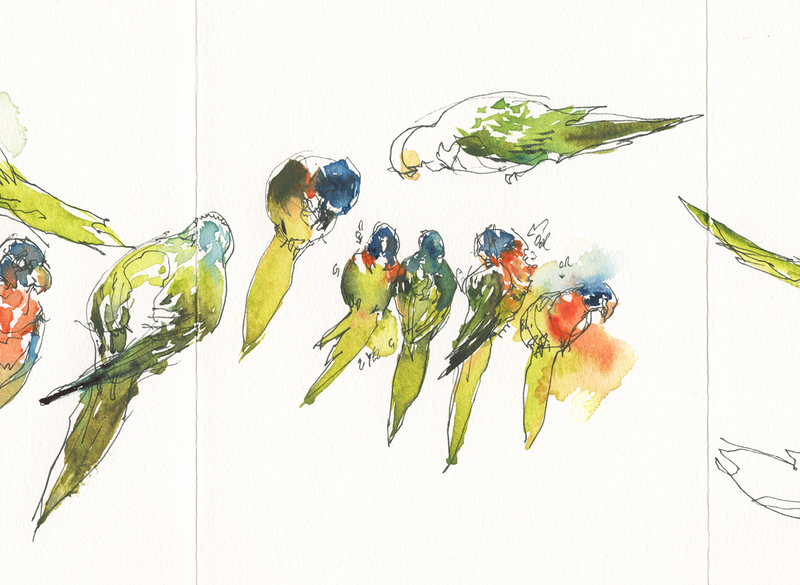 You can see, in these yellow-green lorikeets, especially on the left, and upper right, exactly how I use my rows of color. 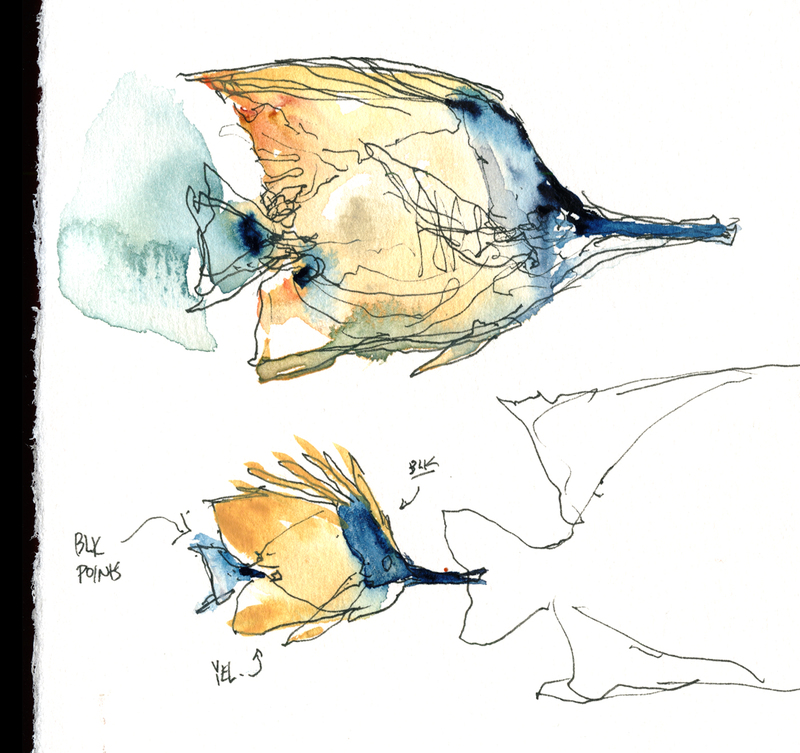 I’m placing touches of full strength pigments – Olive green, Perlyne green, Green Gold – then an accent such as the Turquoise – and of course the intense Pyrrol Orange on the breast – but never ‘smudging’, no manual blending – simply placing the colors right next to each other. I get a light-to-dark gradient by letting the strokes fuse on their own. Yes, I could mix these colors – but by having three values of tubes in each row, I can make gradients faster, and get the wet-in-wet fusion I enjoy. In fact, I used the larger rectangular pans for whites and blacks in this test setup, going forward I’ll just get more mini-squares. I could add a few more specialty shades, such as Lunar Black, or Tyrian Purple. I did these at the aquarium, but this little paint kit is perfect for any situation where space or weight is a concern. 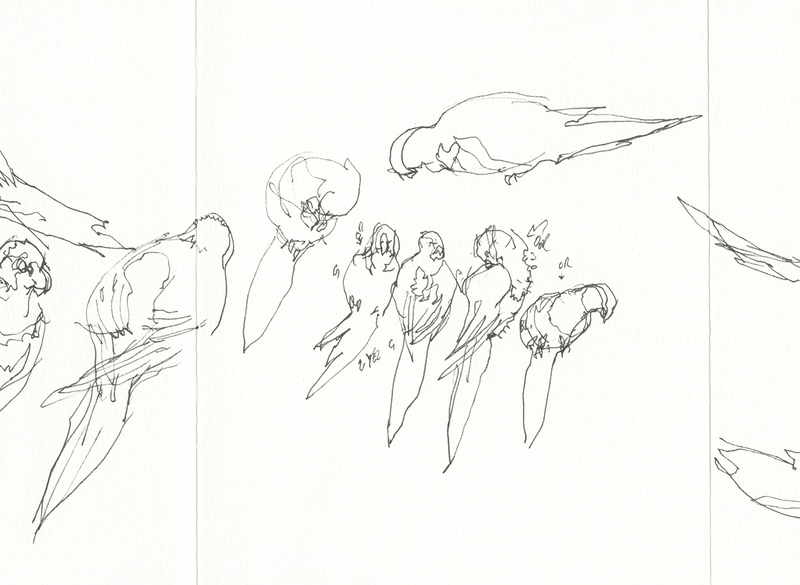 Sketching in the cafe, on a long flight, or taking a sketchbook backpacking. 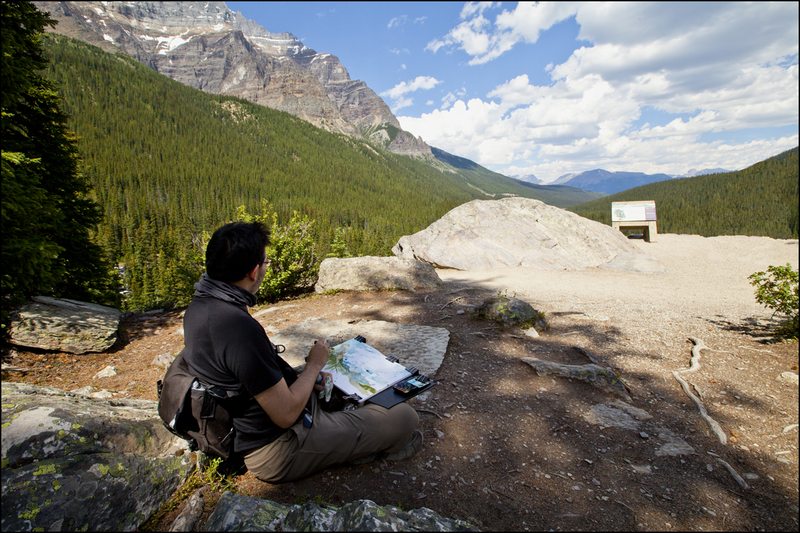 Whatever reason you find to go on an art expedition! If you’re interested in ordering a few of the new pans, or a complete ready-to-go kit, head over to the Expeditionary Arts store, and use the discount code: HOLMES at checkout time. Maria says this will be good for 15% off, from now until March 31st. ← #OneWeek100People2018 is coming soon! You inspire. Are you teaching at all anywhere/anytime soon? 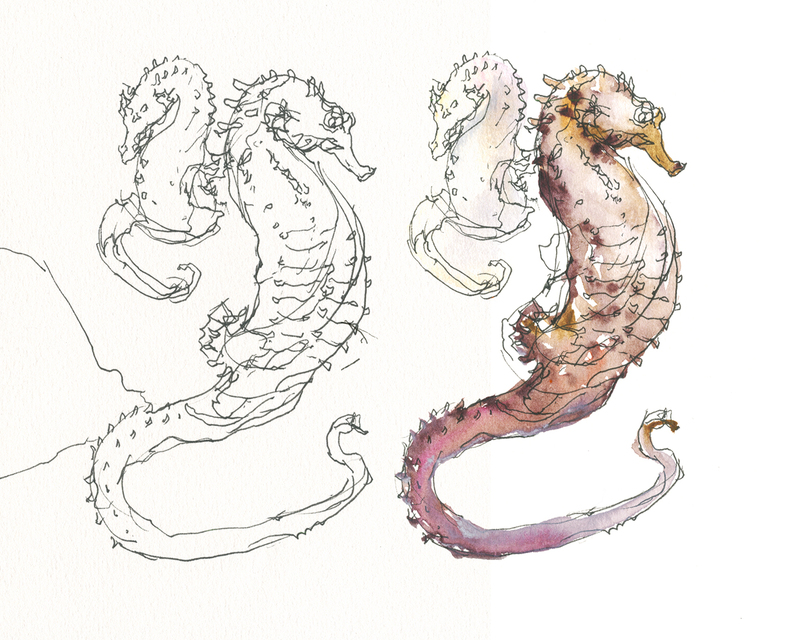 This year, only at the USK symposium in Chicago (June) and Porto ( July). Sorry! Things could change later in the year, but that’s all I know today. Well, thats a reason to go to Chicago in June! Well, thats a good reason to go to Chicago in June! 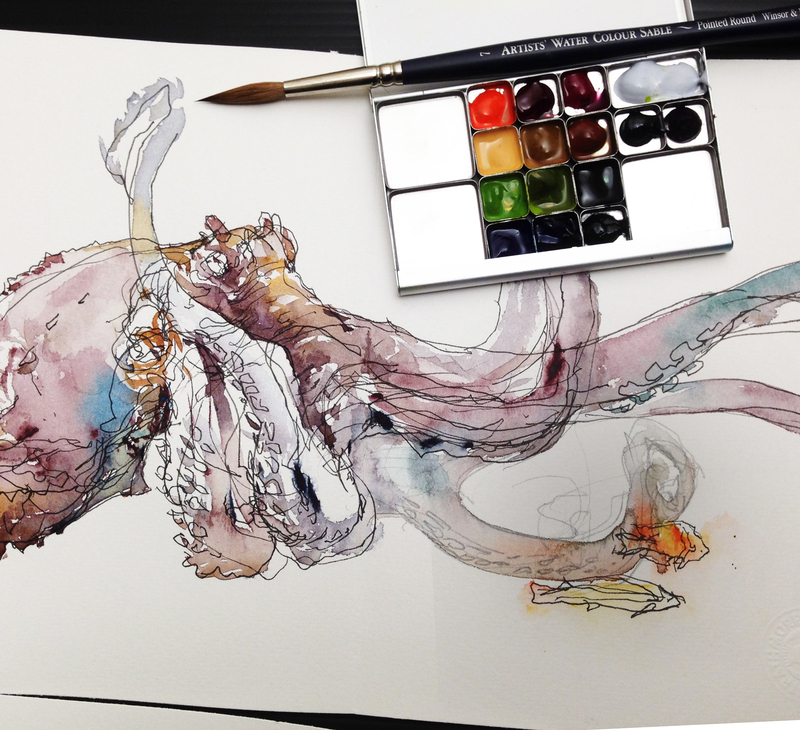 Mark, these are terrific sketches, very exciting and inspiring! I’ve recently gotten my Pocket Palette from Expeditionary Art (before I knew that I would be able to take advantage of this wonderful 15% discount!) and am still in the process of deciding which colors to put into it, and which pans to use. I would advise anyone ordering this to get a variety of sizes of pans at the time of your order, to save on postage. I ended up ordering two other sizes later. I believe she offers one set that comes with a variety of pan sizes. This kit really is perfect for times when space, weight and subtlety on the part of the artist are important. I plan on using it on an upcoming international flight. It will be perfect for a flight! I plan to use mine to try some weird (like all grey) palettes so I don’t have to lay out a lot of paint to try it. 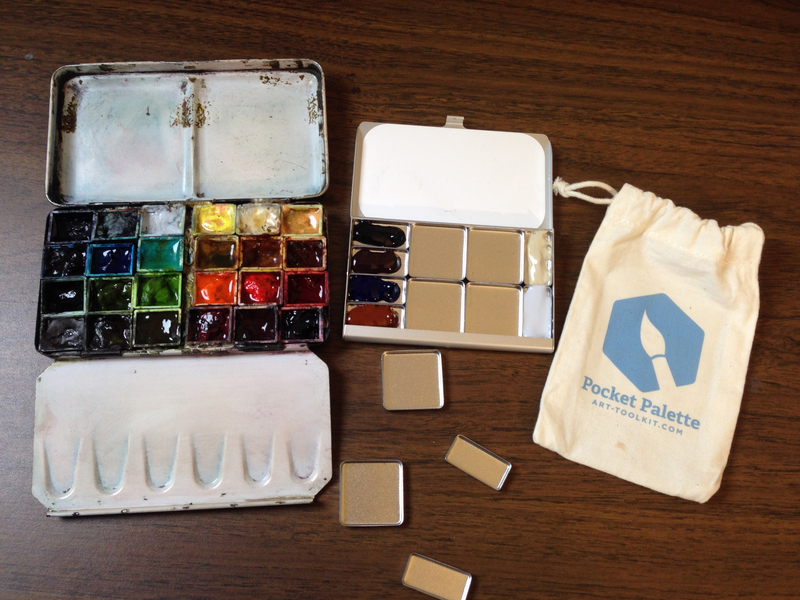 I love my small 3 X 5 palette but I know the pocket palette will be a perfect replacement for my diy mini-altoid tin palette. However, I have not had any luck ordering one. All day there has been a problem getting past my cart. I keep getting a dialogue box that says my cart is empty even though it is not. and no way to resolve it. Is anyone else having trouble placing an order? Yes! I had the same thing happen to me using Safari. I use PayPal and skipped the first option to pay it that way, went through the next screens, added the code somewhere along the way and for the final payment screen, PayPal was an option again and the order went through without dumping my cart. Try that way or you can send an email to Maria and she will contact you. Good Luck! P.S. 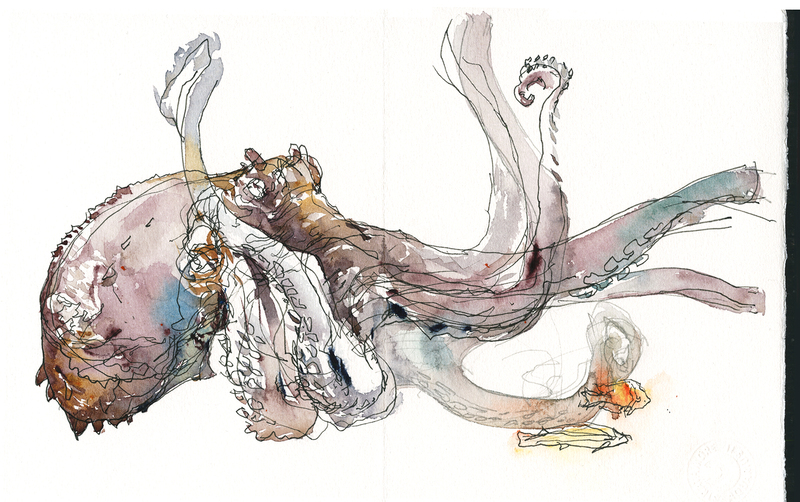 I am thrilled that my copy of “Direct Water Color” has arrived. It is gorgeous and awaits my diving right in! Hi Marc – Thanks very much for your w.c. application tips and pictures and also for your terrific teaching via your blog. I like the size of your “normal” 3×5 kit. Do you know if that is purchasable? Mine is a winsor and newton, Holbein also makes those black tin boxes. So you should see them at art stores. But they come with paint in them. To get empty ones, is try Amazon? MEEDEN Empty Watercolor Tins Palette Paint Case with 12 Pcs Half Pans. It comes with no paint, and is only $10.99. I’ve added four additional half pans, and could probably add another four, but I’m saving that space for a piece of sponge. I’m still planning my colors, but am excited about the size and mixing areas. Hi Marc, I’m planning a month trip to Europe. I plan to take sketching gear but will be traveling extremely light. My thoughts are taking the Expeditionary Art kit and extra small tubes…or the pocket painter….or a kit similar to yours. What would you take a long. I might do one or two sketches a day. Seems to me that if you’re taking tubes with you, no matter how small, you might as well take a larger palette. I’m going to be in Denmark for three weeks and not planning to take ANY tubes. Just 3 teeny, tiny palettes: Cheap Joe’s six color palette, the Pocket Palette from Expeditionary Art, and my Meeden Palette (see above). Fingers crossed that will be enough! Maybe I’m just planning on taking too many colors! Not planning on 9×12, as I’m going with backpack and carry-on. . . a challenge. But because I LOVE Arches, I will bring one (only one) block, as well as a couple of sketchbooks. Sizes to be determined. So Marc, do you think that my Meeden Palette (3×5″ with 16 half pans of CAREFULLY chosen colors, warm and cool primaries and several “convenience colors” plus Lunar Black and Buff Titanium) might be good for three weeks? I know I won’t be able to sketch every day. Is that bright green on the far left of the palette one of your standard palette’s greens? Thank you Marc! It’s a wonderful green indeed.